Ghost Tours of Boston, Savannah, St Augustine, & Key West BLOG » Blog Archive » Famous ghosts, scary spirits and intriguing history, I took a ride on the dark side in Boston. « Is the ancient city haunted? You be the judge. I’ve always thought of Boston as this proper town just overflowing with history and oozing with patriotism. And of course, those images are right on target—but on the Ghosts and Gravestones Tour of Boston I learned about the sinister people, shady characters and spooky places that gave the city its’ haunted reputation. First, let me tell you, the Gravedigger Guide was hilarious and compelling. Dressed in colonial garb, speaking in true dialect of the region and era, and spewing out fascinating facts about Boston‘s most infamous villains and events, he made the tour so entertaining. For me, the most spine-tingling part of the evening was going into the two cemeteries. This part of the tour we walked through the burial grounds that are approximately 400 hundred years-old. It was eerie seeing all those graves up close, at night, while hearing tales of some of the legendary people that are buried there. Paul Revere is there, John Hancock and other really distinguished Bostonians are also among the dead. And while you’re strolling through, the Gravedigger Guide fills you in on executions and tortures that took place during the colonial years as well as unmarked graves and the big grave robbery scandal. I was more than spooked–although I enjoyed it just the same! The Ghosts and Gravestones Guide was also really knowledgeable on some of the gruesome murders and mysteries that Boston is famous for–I never really knew the whole story about the Boston Strangler, I was never brave enough to see any of the movies made about it. So I liked finally getting the details about that and some of the other infamous crimes that took place in Boston over the centuries. The big thrill was seeing the Omni Parker House, which is known to be the most haunted hotel in Boston. People have reported hearing voices and experiencing many strange phenomenon while staying there-especially those that were lucky enough to get room 303, which is the room that Henry Wadsworth Longfellow is said to have stayed in many times and is believed to be haunting to this very day. If you love history as much as I do, Boston is a city of discovery and delight. Our nation’s heritage is evident on every corner, from the Boston Common to the Boston Harbor and down the many picturesque streets and alleyways. 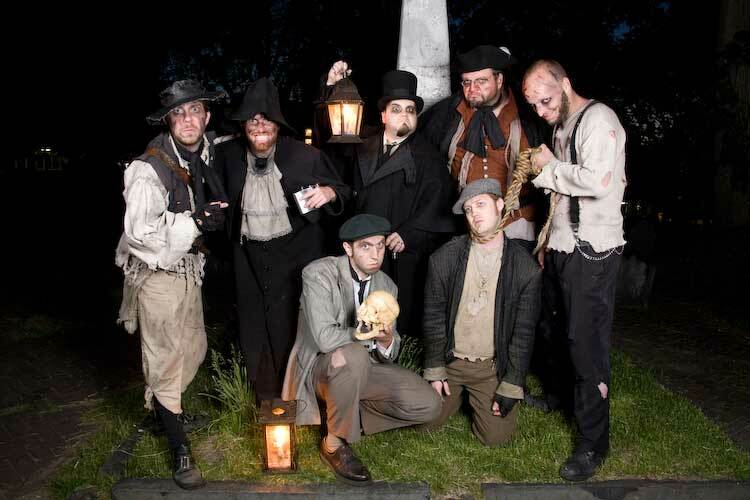 And one of my fellow Ghosts and Gravestones Tour guests told me that she had taken the tour three times, and each time there was a different, more colorful Gravedigger Guide at the helm. I guess that means I’ll have to go again, only this time I’m bringing a friend…or two! This entry was posted on Friday, September 26th, 2008 at 9:13 am	and is filed under Boston Ghost Tour. You can follow any responses to this entry through the RSS 2.0 feed. Both comments and pings are currently closed.